The West Branch DuPage River (WBDR) drains through the City of Warrenville with a large tributary area originating as far north as Schaumburg in Cook County, Illinois. 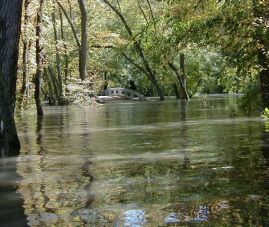 The river leaves Warrenville, draining into the Fawell Dam flood pool in the McDowell Grove Forest Preserve. Information about Fawell Dam and the West Branch DuPage River, in general, can be accessed at a website maintained by DuPage County by clicking here. At the City of Warrenville’s request, DuPage County initiated the preparation of an Addendum to the Watershed Plan for the West Branch DuPage River, including hydrologic and hydraulic modeling of the river. The City of Warrenville convened a workgroup consisting of staff and elected officials to study and answer questions regarding the impact of Fawell Dam on flooding in the City of Warrenville.